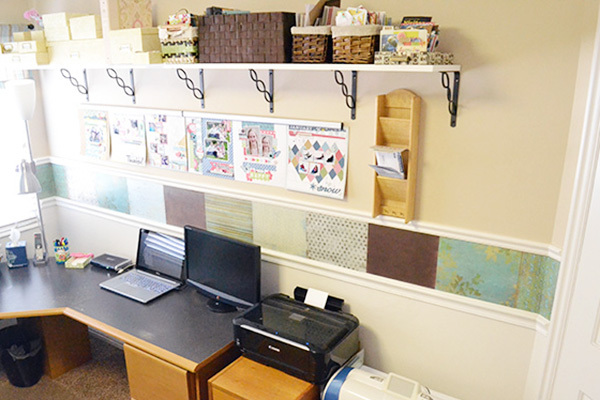 Aly Dosdall: craft room clean out: final reveal!! 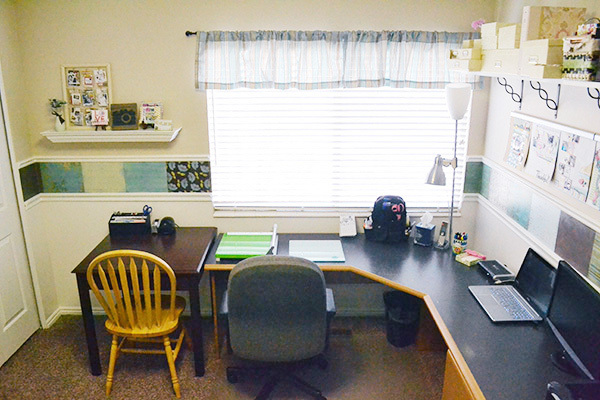 craft room clean out: final reveal!! 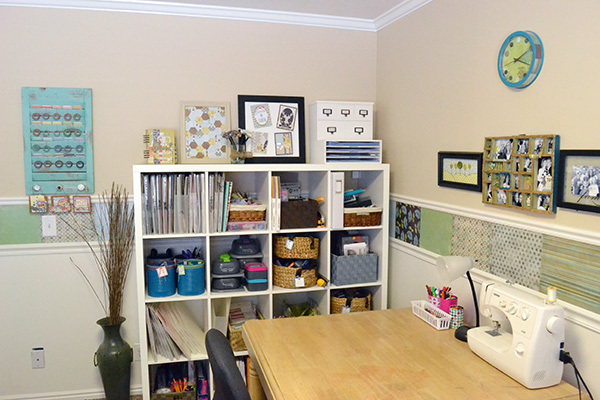 Before I reveal the photos of my newly re-organized space, I want to share some tips with you that I've picked up over the years about PLACEMENT of supplies in your craft space. This is just an idea, and it doesn't always work out perfectly since sometimes spaces present limitations, but the basic premise it to try to place items that you use most frequently in closer proximity to your workspace, and in an easily accessible container. 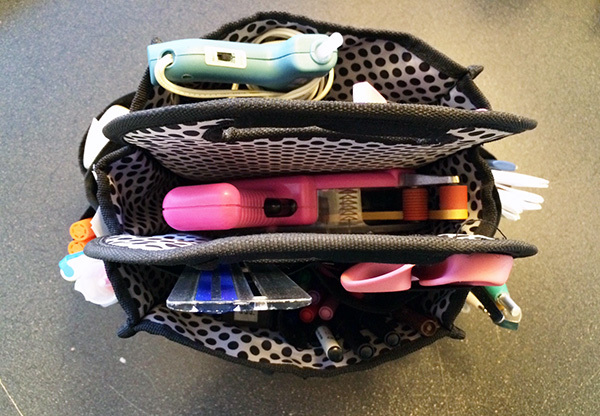 For example, I have a canvas caddy on my work surface that contains the adhesives, scissors, rulers, journaling pens, craft knifes, tweezers, paper piercers, and other small tools that I use very frequently. I save myself time and effort by keeping those items within arms reach while I'm creating. About once every quarter I re-evaluate the exact items I keep in that caddy and change them (if I need to) based on my creative habits. I also keep my main paper trimmer (the one I use most frequently) out on my work surface. As I mentioned in my last installment of this series, I keep other larger tools (paper trimmers, score boards, circle cutters, etc) in drawers within arms reach of my work station because I use them frequently as well. Of course, I can't keep every item I use frequently within arms reach of my work surface because that's not how my room is set up. But, I've tried over the years when organizing my room to think about that as I place items in my space. My suggestion for you is to sit down and mentally go through your creative process.Take a look at your last 10 projects, and determine what supplies they all have in common. Think about how you can rearrange your space so that some of those most frequently used items are as close to your workspace as possible. You'll be glad you did! Now, on to the final photos of my space! I'll start with a group of photos taken as I turned a 360 in my space, and then I'll share some detail photos. The first photo starts from the left side of my space (as you enter) and the photos that follow were taken as I turned to the right. This is the corner where I keep most of my supplies in my new Ikea Kallax shelving unit. The table you see with the sewing machine is used mostly for my youngest daughter to draw and paint with me while I work in my space, but I also use it for sewing and cutting items larger than 12 inches. 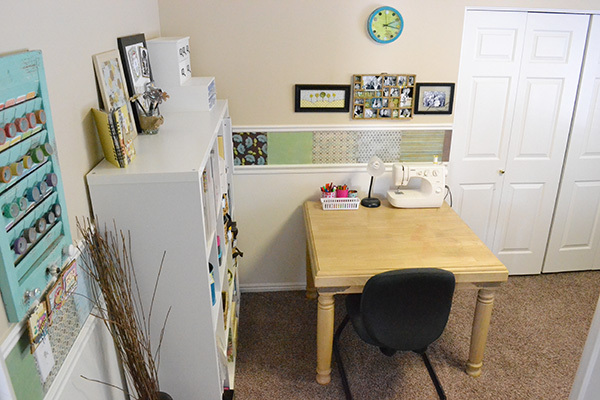 Next to the sewing table is the closet where I keep my scrapbook albums, a few generic paper craft supplies (colored cardstock, generic hard and soft embellishments), some family history documents and journals, and some other basic craft supplies (floral, sewing, fabric, etc). To the right of that is my main workspace--a corner unit placed directly in front of my only window so I can work with as much natural light as possible. I keep my glass cutting mat and CutterPillar out on my desk since I use them for every project. Along the right wall of my space I have a wall mounted shelf where I keep a few Anna Griffin card kits and stamps, all of my mini albums, completed cards that I keep for giving away, and a library card photo display. I also have a couple of Grip Strips to display some of my most recent (and favorite) layouts. This last shot is my pocket page (Albums Made Easy, Project Life) storage. The top drawers contain all my 4x6 and 3x4 cards, and the bottom section contains all of my page protectors. I also keep a magnetic display board next to it to display some of my favorite recent cards. Overall I'm really happy with the way things are, though there are a few minor things I'm sure I'll tweek over the next few months to get things just right. I think that's one important thing to remember about organization--it's a continual process, not a one time event. Happy organizing! P.S. if you have any questions about my space or about organization in general, feel free to ask in the comments section below. Hi Aly, just a question about your washi tape storage. Is that one of the WRMK shutter memo holders - heavy distressing? And if so, did you just change out the deco knobs at the bottom? Thanks for the info. Your space looks great!! Hi Cynthia! Thanks for the kind words. =) Yes, that is one of the We R shutters--heavy distressing. Those darling decorative knobs came with it. It's just a tad darker in real life than it appears in the photo. When I photographed my space it was a very dark and cloudy day so I had to adjust some of the photos in Photoshop to get good lighting. I've got the red one in my family room with some family photos and mementos-love it! This came out wonderful Aly, I am so glad I could help. It is funny I am doing the same thing -- Yet I ordered a box of your stuff. Funny how life is. Hi Gin, it can be a challenge trying to organize multiple crafts in one room. And, most of my years scrapbooking have been on a tight budget, so I know what you mean. The best advice I can give is to really analyze your own creative habits and process. How often do you sew versus how often do you scrapbook? Are there supplies that are exclusive to each craft, or are there supplies that you use for multiple crafts? Try to sort and organize your supplies based on how you use them. Take some time to think about your creative process and make a plan ahead of time. Hope that helps. How can I get the Project Life storage unit? I your room!